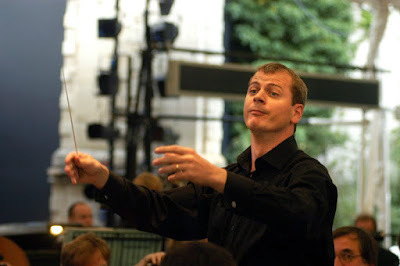 The conductor Stuart Stratford has cropped up quite a bit on this blog over the years, conducting at Opera Holland Park and at the Buxton Festival as well as at English National Opera, not to mention other performances such as Shostakovich's Khovanshchina for Birmingham Opera. Now Stuart has a new string to his bow, since June last year he has been music director of Scottish Opera, where he has recently conducted Jenufa and Rusalka. I met up with Stuart in the cafe at Holland Park, before one of his performances of Mascagni's Iris at this year's Opera Holland Park. I was interested to know Stuart's thoughts on, and plans for, Scottish Opera now that he has started to get into the job. But, as we were in Holland Park, conversation inevitably turned to Mascagni's Iris. 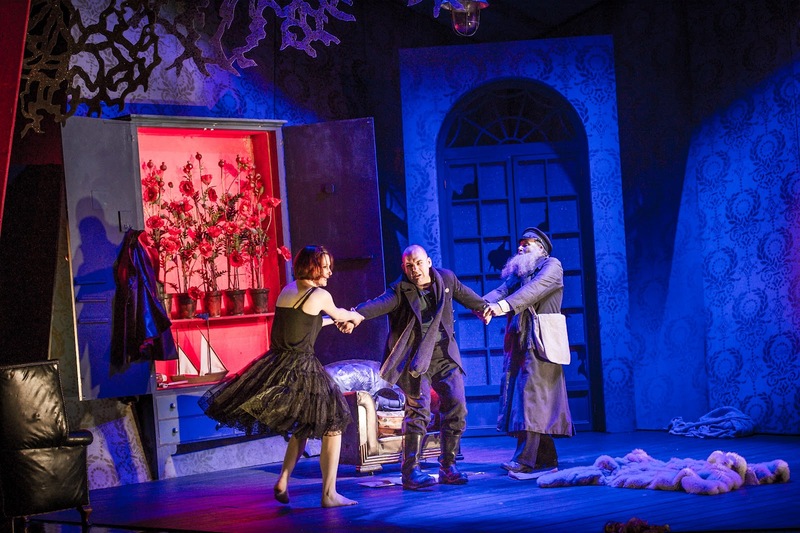 We both agreed that Iris was a real rarity (see my review), and Stuart is not only enthusiastic about the opera, but finds it fantastic the way Opera Holland Park dusts off unjustly neglected operas. This season's Iris is sold out and an opera like Montemezzi's L'amore di tre rei (which Opera Holland Park performed in 2015) was a huge success. But to make such projects work you really have to take your audience with you, something Opera Holland Park has clearly been able to do. Stuart cites Simon Rattle's period in Birmingham with the CBSO as a prime example, with the audience really coming to trust Rattle and not thinking twice about coming to a concert, whatever was programmed. Stuart sees this as the art of giving people what you think they need. And something of this has rubbed off on Stuart's programmes in Scotland. One of his innovations for Scottish Opera is a series of Sunday afternoon concerts. The 2016/17 series opens with a performance of Mascagni's L'Amico Fritz (on 23 October 2016, with a strong cast including Peter Auty and Natalya Romaniw). This is an opera which Stuart conducted at Opera Holland Park in 2011, and which he rather gleefully informs me has not been performed in Scotland since 1891 (not long after the premiere). Stuart calls it a fantastic piece and he feels that Mascagni's music is vastly underestimated. It falls short when compared to Puccini, though only just. There are similar themes between Mascagni's Iris and Puccini's Madama Butterfly yet Iris is far more brutal and disturbing. Stuart refers to the 'disturbing allure' of the music and thinks that this makes audiences feel party to the events in the opera; the work is asking you to be complicit. Stuart calls it a unique piece with its combination of striking music and grubby story. Also there is a Maeterlinck-like symbolism in the plot which points forward to Debussy's Pelleas et Melisande, as does Mascagni's use of whole tone scales. Stuart talks about the way Mascagni pushes the harmony beyond Wagner, distancing himself from Wagner, and there is even a moment where Mascagni uses something approaching a tone-row. The recently announced 2016-17 season at Scottish Opera is the first where Stuart has had any input though, the advance planning of opera companies being what it is, this season only has a 'little bit' of Stuart in it. They have commissioned a new opera from Lliam Paterson to act as a companion to Bartok's Duke Bluebeard's Castle. The double bill is a co-production with the Scottish theatre company Vanishing Point and is directed by their founder Matthew Lenton, so having a piece by Paterson, who is Scottish Opera's composer in residence, seems appropriate. Entitled The Eighth Door, Stuart describes the new work as a prequel to Bluebeard and the work is deliberately composer to set alongside Bartok's opera and has huge resonances. Janaceck Jenůfa - Sam Furness with chorus. For Stuart the whole season is lovely, with a revival of Thomas Allen's production of The Marriage of Figaro (conducted by Tobias Ringborg who is currently conducting Idomeneo at Garsington Opera), Stuart conducts a new production of La Boheme (directed by Renaud Doucet) and there is a new production of Philip Glass's The Trial directed by Michael McCarthy and conducted by Derek Clark (Scottish Opera's head of music). This latter is a co-production with Magdeburg and Music Theatre Wales (where Michael McCarthy is artistic director). Stuart is a huge fan of Glass's music, though he admits that when he first saw Einstein on the Beach he initially thought 'what have I come here for?'. But he came to understand the music was written deliberately to get you in a different frame of mind; Stuart finds it akin to meditation. Themes do not develop and there is something ritual about it, and this non-development is intended, making it very radical. Stuart has quite a long association with contemporary music starting with his assisting at the Almeida Festival and he conducted John Adams' Doctor Atomic at Finnish National Opera. He conducts new pieces whenever he can, and finds the process very similar to working with older works. In fact he sees the best way to treat a new piece is as if it were vintage, ie. with great respect. By contrast he thinks you should be prepared to make strong decisions about older pieces. The conductor's job is to make the piece work, and instead of worrying about the urtext you should be using the urtext to reveal the piece. Stuart is enthusiastic about the tour, staying he was very keen to do it and that it was one of the great things that Scottish Opera does. As far as Stuart is concerned, everywhere in Scotland deserves to have access to music making of the best quality. He is also interested in who comes to the performances on the tours, and wants to see what the demographic of the audience is. Stuart feels that the UK is poorly served for the arts (particularly music) when compared to countries like Germany, so for some of the towns on the tour Scottish Opera's visit will be one of the few professional artistic ensembles visiting. Of course, any conversation about Scottish Opera inevitably touches on the company's money troubles and retrenchment in recent years. Stuart is quite robust and sees it as his job to help ensure that the company makes sure there is the maximum artistic activity for the money. This involves hard decisions, but the goal is to maximise the amount of opera performed, and to achieve value for money. To a certain extent, these are stock phrases, but when Stuart says 'as the whole of Scotland pays for the company, going out on tour is both a necessity and a privilege', his enthusiasm becomes clear, and I suspect that we might expect more innovative solutions from him in future seasons. Stuart trained in Russia, studying from 1995 to 1998 with the great Ilya Mussin (who taught Valery Gergiev) in St Petersburg. Stuart refers to it as a wonderful place to be, and an exciting time as the type of government in Russia changed. It was also an amazing place to learn about Russian music, and this continues to have a strong place in his heart. He would love to explore more of Rimsky Korsakov's operas, as he feels his music is just not generally known in the UK. Stuart conducted Mussorgsky's Khovanshchina for Birmingham Opera, an experience he calls fantastic, referring to the passionate music. He thinks Russian composers like Mussorgsky have distinct voices, with a new way of looking at opera compared to the Germans and Italians. Mussorgsky left the work incomplete and Birmingham Opera used the Shostakovich edition, which Stuart thinks works well. He finds that the natural sound worlds of Mussorgsky and Shostakovich are similar, the way they write for orchestra with pure blocks of sound, and bare primary colours (as compared to Rimsky Korsakov's use of a myriad of mixed colours). Stuart will not be conducting at Opera Holland Park next year, because of commitments with Scottish Opera but he does not rule out future visit as he finds it both a responsibility and a treat to work and an unknown and neglected piece. When talking about the future Stuart says that he does not have a master plan, and thinks that a career is something that you back look on. He is delighted to be where has is and doing what he is doing. He thinks it is important to be in the present and to achieve what you want to achieve, and not look back (something which he says is true of conducting as well). Though of course, this doesn't mean that you cannot plan. Being involved in running an opera company is something which certainly interests him, and there are many aspects to it including casting and planning repertory, as well as seeing ways to deliver opera in better ways. He sees it as important to develop opera for new audiences, or the art form will die, but it is evolution which is important not revolution. You need to keep evolving, changing, and questioning; is this the best way to do the piece or is there a better way. When I ask about Stuart's favourite opera to work on, he laughs and says that inevitably it is the one he is working on at the moment. So currently it is Mascagni's Iris, and will then be Donizetti's L'elisir d'amore which is conducting for Western Australia Opera in Perth.